Perhaps the most defining moment in the quest of unification will begin tomorrow when eight of the world's top players will battle for the FIDE World Chess Championship in San Luis, Argentina. The chess world has been plagued by a series missteps which mired the professional chess circuit in a state of turmoil. On April 16, 2005, FIDE President Kirsan Ilyumzhinov announced the championship and invited the world's top eight players. (press release), but Garry Kasparov and Vladmir Kramnik both bowed out. One month prior to the tournament announcement, Kasparov had announced his retirement from professional chess. Kramnik refused to play on the basis that he holds a world title wrestled from Kasparov at the BrainGames World Championship in 2000. He successfully defended that title in a match with Peter Leko last year. Although Kramnik continues to hold that title, his lackluster play and poor health has tarnished his crown. However, there are recent talks that the San Luis winner may indeed play Kramnik to unify the world crown once and for all. The level of anticipation has not existed for a chess championship since perhaps Kasparov's championship years. There is a general feeling that this tournament will pave the road to a stable future for the chess world. The Chess Drum will provide coverage on the action! The Chess Drum, "2005 FIDE WCC: Topalov on Top! !," 3 October 2005. 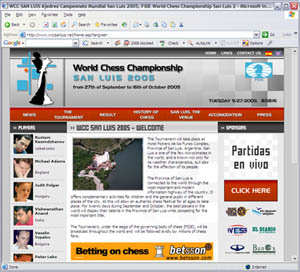 The Chess Drum, "2005 FIDE WCC: Topalov destroying field… on 7-1," 8 October 2005. The Chess Drum, "2005 FIDE WCC: FIDE Champ Kasimjanov ends reign," 13 October 2005. The Chess Drum, "2005: FIDE WCC: The New Champion weighs unification," 23 October 2005.